What is the Cooke Look? Jonathan Maxwell is the articulate lens designer and consultant who led me on a tour of the Cooke factory in Leicester a couple of years ago. Jon has worked with Cooke and Taylor Hobson, taught courses for SPIE, and has published two books on optical design. For a long time, many of us cinematographers have been fumbling with words to try to describe that look, and it sounded more like wine-tasting than optical appreciation. We had epithets like roundness, gentle fall-off, smooth and gentle, cosmetic silky skin tones, and so on. Here is Jon’s illuminating reply, and it is the first technical explanation I have ever heard. At Cooke we take particular precautions, and a pride, in how we correct and adjust the aberrations in our lenses, and I’ll talk technically about that in a moment. But, before I do, I have to share a secret with you: the fact is that cinematographers, who obviously appreciate the Cooke Look, wax eloquent about it, but very often the language is of an artistic nature, and, frankly, we humble technicians have difficulty in really understanding that language. Having said this, our chests of course swell with pride when we read of or hear creative people in our industry talk about how they love the “look” we manage to achieve, but we think to ourselves “all we have done” to achieve that look is to follow our scientifically determined standard procedures! So what are these procedures? A large part of it is about balancing the focusing of the three different wavelengths, red, green and blue, which don’t normally fall on the same focal plane simultaneously. Appreciating the details of this situation and how we design and adjust lenses in the face of it is necessary if one is to understand where the Cooke Look comes from. Firstly, all modern lenses are what we call “achromatic” (without colour) and occasionally “apochromatic” (completely without colour), that is, they are corrected for chromatic aberration. Nearly all lenses that the cinematographer comes across are achromatic, rather than completely apochromatic (in spite of some being called “apo-something”), and this means that there is a residual difference in focus between the red, green and blue focal planes. Except in very unusual circumstances, the distribution of these chromatic focal planes, working from the lens side of the focal region to beyond the focal region, are as follows: green focuses first, and then red and blue focus together (making magenta) a little further away from the lens. Under normal circumstances, unless special precautions are taken (as they are at Cooke), the longitudinal distance between the green focus and the red + blue focus will be approximately one thousandth of the focal length of the lens.This separation between the green and the red + blue (magenta) focus is called the longitudinal secondary spectrum. The reason that longitudinal secondary spectrum wants to be approximately one thousandth of the focal length is mainly associated with the types of optical glass that are available, but it is also influenced by the optical construction of the lens. Ah….so, secondary spectrum wants to vary with focal length? Yes! 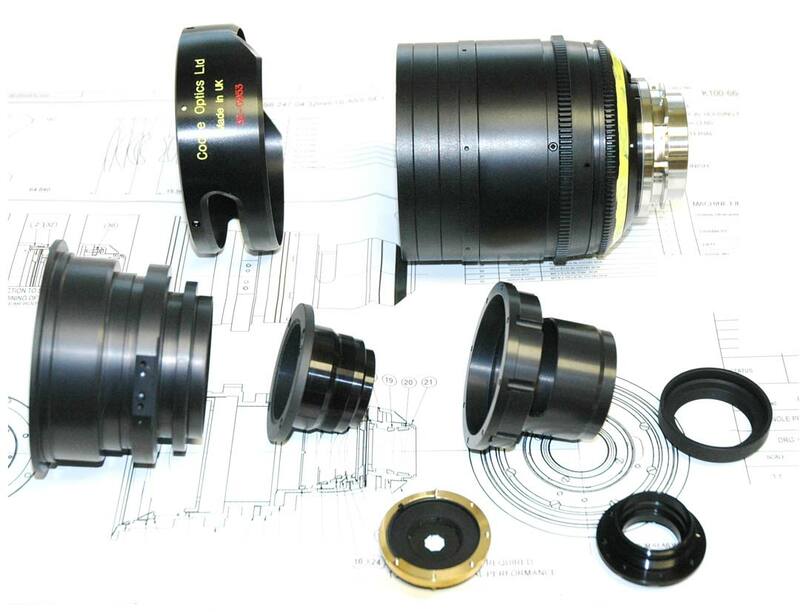 And this should immediately ring alarm bells for you, because we design and make ranges of prime lenses that have focal lengths that, for 35mm detectors, vary, for example, from 12mm to 300mm. So the secondary spectrum will (unless special precautions are taken) vary from 0.012mm to 0.300mm, and so the images at various focal lengths will look chromatically different. This is unacceptable, and the lens designer’s job is to devise suitable constructions for each focal length of lens and to use appropriate types of optical glass in those constructions to hold the secondary spectrum more or less constant for all focal lengths. In the case of a zoom lens this issue is particularly problematic, in that, although the lens construction does vary with focal length change (in order to zoom the lens), the types of glass in the zoom lens do not change, so the secondary spectrum will vary from one end of the focal length range to the other. This is one of the fundamental limitations of zoom lenses for cinematography. Next, we have to understand that for any achromatic lens, as we go through focus, there will be a subtle change in the colour fringing around the fine detail in the image. When the focus of the lens is so adjusted that the green image plane is at the detector, then the red + blue (magenta) image will be slightly out of focus, and there will be a subtle magenta fringe around the fine detail in the image. (You can see this when you go through focus on a lens projector–you see green and then magenta color fringing.) Similarly, when the lens is so adjusted that the magenta image is at the detector, there will be a subtle green fringe around the fine detail of the image. Roughly halfway between the green focus and the magenta focus there is an image plane where the two coloured fringings (green and magenta) mix to make a colourless black and white image. This plane is known as the achromatic image plane, and it is this plane that cinematographers choose when they focus the lens. So far in this discussion, nothing that is particularly remarkable has been described. I have just been reviewing what every lens designer knows about the necessary achromatic correction of any lens, albeit with some special emphasis on particular points. But here comes the more specific aspect of this subject that explains the Cooke Look. If the lens is suffering from spherical aberration, the sharpest image plane, that is, the focal plane where the most fine detail of the image is resolved, will not lie at the achromatic focal plane. This is the question of adjusting the design and, particularly, the final assembly of the lens, to align the best resolution focal plane with the achromatic focal plane. That is what creates the Cooke Look. There is another stage in this procedure, which is about applying these criteria to the off-axis correction of each lens. In this case, rather than adjusting the spherical aberration to get alignment between the achromatic plane and the best resolution plane, we adjust astigmatism.